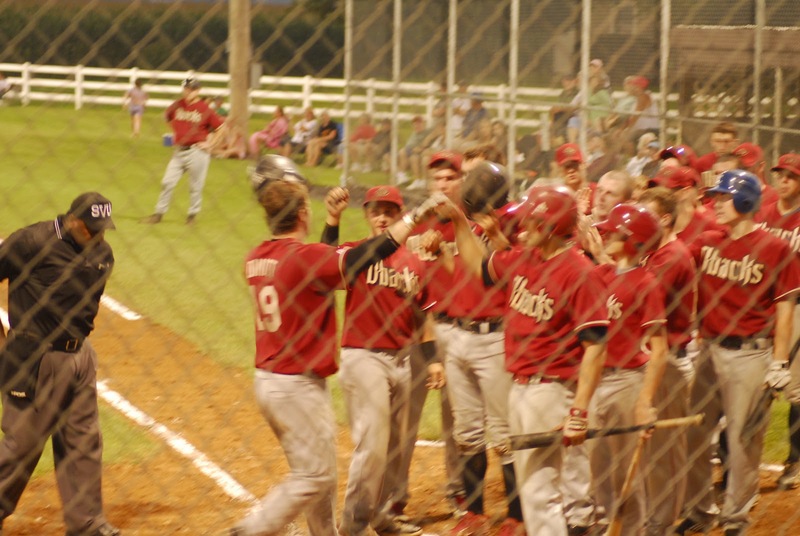 Congratulating Corbin Lucas on his game-winning home run. STUARTS DRAFT — The Stuarts Draft Diamondbacks gave starting pitcher Drew Dobbins a proper send-off Thursday night, defeating the Bridgewater Reds 9-7 in an exciting first game of the Rockingham County Baseball League playoffs at the Diamond Club. Dobbins, who leaves Friday for a new job in Texas, was moved up in the series pitching rotation to have one more chance to help the D’backs take the next step toward winning the elusive RCBL crown. Although Dobbins didn’t figure in the final decision, he did pitch well enough to put the Draft in front before the Reds made a late-inning comeback. The Waynesboro High School grad pitched five shutout innings out of the gate, keeping the Reds’ hitters off-balance with a variety of off-speed pitches and his fastball. The Reds, trailing 6-0 entering the sixth, finally roughed up Dobbins a bit with a lead-off double by Josh Wright, a base hit by Tyler Hoffman and two-run base hit by Craig Martin. Bridgewater, who eliminated reguar-season champion Clover Hill two nights earlier, kept the pressure on in the top of the seventh, scoring two more runs off reliever Donovan Huffer after a walk, base hit and two-run double by Daniel Heatwole. The D’backs used the long ball to stake their early lead. Huffer hit a solo shot in the second which caromed off the top of the fence and Jay Thompson drove in the second run in the third with a sacrifice fly. In the bottom of the fourth, Brandon Clark went deep off of Reds’ starter Nick Corbin. The big blow came in the bottom of the fifth when catcher Wes Dimitt, who had hit a home run on Tuesday, socked a three-run shot. 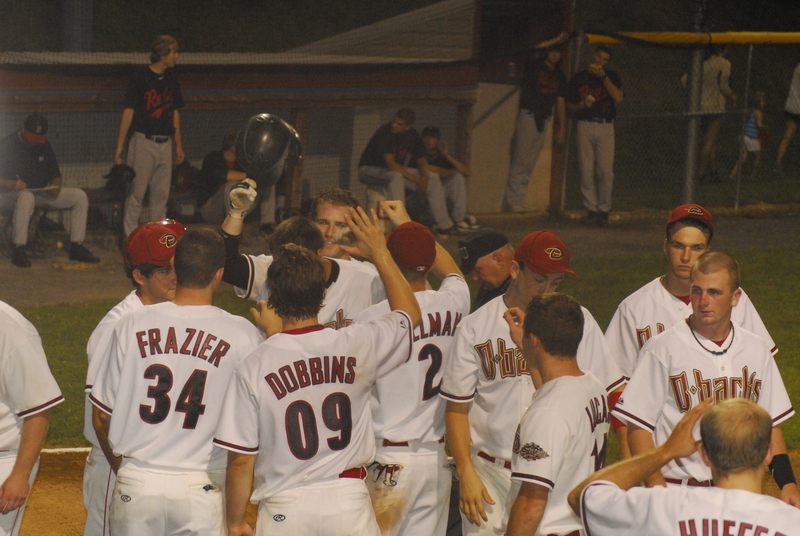 Dimitt’s homer was his fifth of the RCBL playoffs. Clark drove in the D’backs’ seventh run with a sacrifice fly in the bottom of the seventh, but the Reds tied the score in the top of the eighth as Huffer walked the first three Reds. Kevin Bocock brought in two runs with a hit and the tying run came in when Thompson, who had relieved Huffer, plunked Chad Rhodes with a pitch with the bases juiced with Reds. But with game one hanging in the balance, Stuarts Draft struck the winning blow by virtue of the long ball again in the bottom of the eighth. With one out, Elliott Erkel lifted a base hit into left and after a ground out, leadoff batter Corbin Lucas drove a line drive over the right-field fence. The Reds got the potential tying run to the plate after Ryan McAlister doubled to left with two outs, but Thompson retired Bocock on a grounder to first and recorded the win in his two innings of relief. The Diamondbacks have now connected on 14 home runs in their seven playoff games to date. The series resumes tonight at Wayland Field in Bridgewater weather permitting. Looking up at Alan and Jerry in the press box. MONTEZUMA, August 7 — The Stuarts Draft Diamondbacks were eagerly looking forward to having another shot at dethroning Rockingham County Baseball League perennial power Clover Hill. On Tuesday night, they did their part, eliminating homestanding Montezuma 4-0 with an impressive pitching performance from Chris Henkel and reliever Jay Thompson. But, just several miles away, the Bridgewater Reds did the deed for the D’backs, knocking out the five-time defending champions in a decisive game five in Clover Hill. The two results set up a best of seven series for the 2012 RCBL championship between Stuarts Draft, the four-time bridesmaid to Clover Hill for the past four seasons and fourth-seeded Bridgewater.Game one of the championship series begins Thursday at the Diamond Club in the Draft. Two home runs provided all the offense of the night Tuesday, as the D’backs Wes Dimitt and Brandon Clark hit two-run shots over the fence in the fourth and eighth innings respectively.Other than the two homers, Montezuma starter Alex Foltz matched Henkel for effectiveness. Dimitt, a Stuarts Draft High School grad went deep off Foltz in the fourth after another ex-Cougar, Ryan Cooper, singled and moved to second on an outfield error.Baserunners for the Braves were at a premium as a stellar defense behind Henkel kept Montezuma off the scoreboard. In the top of the eighth, Dimitt drilled a base hit down the third base line before Clark jacked Foltz’ pitch over the right-center field fence, giving the Draft a four-run cushion.Thompson relieved Henkel in the bottom of the eighth and surrendered one single before closing the door. He came back to strike out the side in the bottom of the ninth after issuing one base on balls.Henkel only allowed two hits in his seven innings of work. “Clover Hill and us is a good rivalry,” Dimitt said. It would be nice to beat them, but we’ll take whoever.” Dimitt had three hits for the D-backs, who won the Montezuma series three games to one.”This was a good series, we pitched about perfect tonight,” said D’backs skipper Orvin Kiser.Stuarts Draft pitching shut out the Braves in back-to-back games. The team celebrates after Dimitt’s homerun. Jerry Carter – Our play-by-play radio announcer for ESPN 1240. 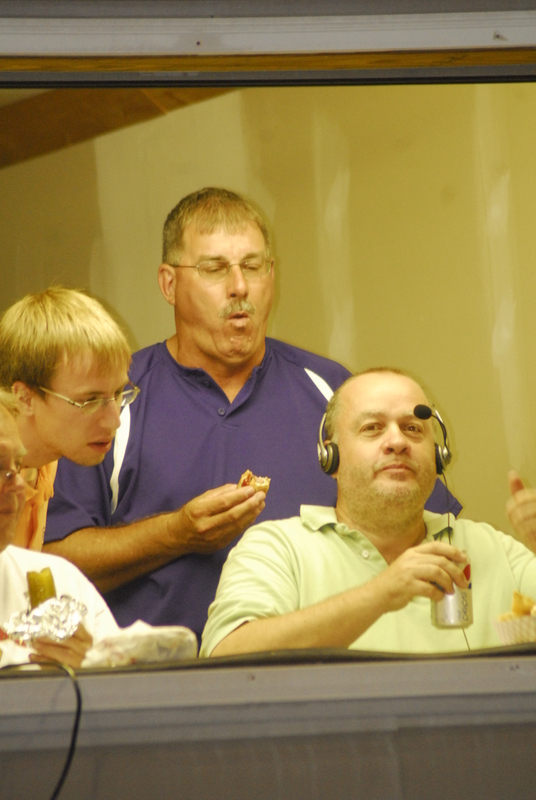 Alan Knight – Providing the color coverage for ESPN 1240. Bill Meade – Crystal Clear Delivery’s prime time reporter. Rebecca Carter – CCD’s photographer and hostess. Game #1 -We ventured to Montezuma, Virginia to watch the Stuarts Draft Diamondbacks take on the Montezuma Braves. The Braves were down 2-1 in the series, trying to force a game 5. Stay tuned for more posts that will include Bill Meade’s story and Rebecca Carter’s photos!